2515 has no other items for sale. 1917 P TYPE 1 STANDING LIBERTY QUARTER, VG/F, ORIGINAL SURFACES, PROBLEM FREE! 1917 T1 STANDING LIBERTY QUARTER - NICE ORIGINAL VF VERY FINE PRICED RIGHT! 1917-S Standing Liberty Quarter, FULL Head, PCGS MS 66 FH ** Scarce This Nice! 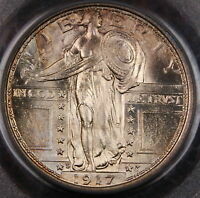 1917-S Standing Liberty Quarter 25C Coin (Type 1) - PCGS MS66 - $1,950 Value! Sales tax may apply when shipping to: IA*, MN*, NY(8.0%), WA*. If you are purchasing multiple items please request an invoice before paying so that we can adjust the shipping charges.